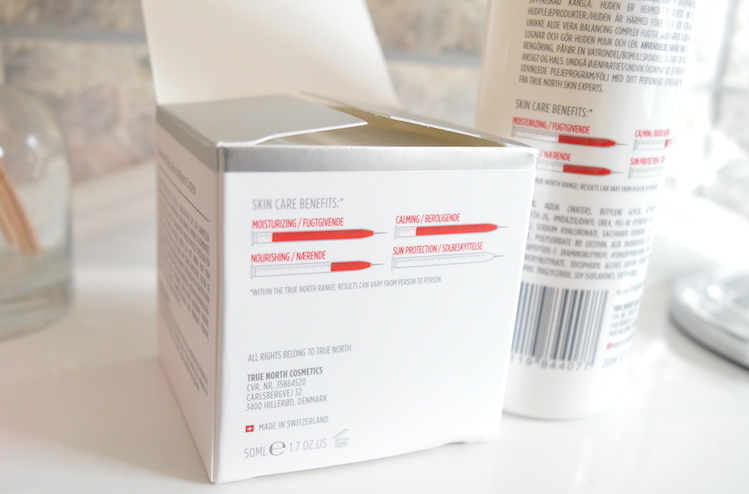 With the change in season, my skin went from dry to dryer and so sensitive…It really felt like it needed a good fix. So for the past few weeks I have been using the True North De-stressed range (You can get it from Harvey Nichols in the UK). So, if you have never heard of the brand before, True North began life in Denmark and it is made in Switzerland ( Hence the name True North!) They offer a one size fits all approach to skin care, with the De-Stressed products catering for all ages and genders in a single range. They are also really high quality products! 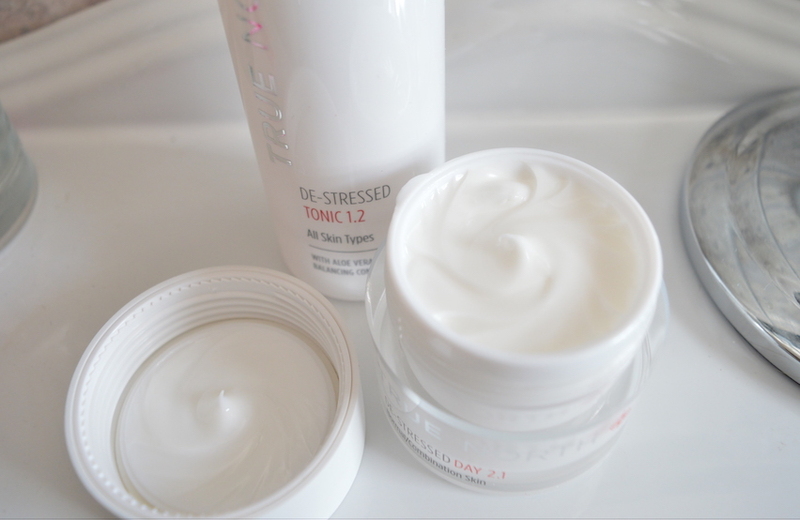 I have been using the De-Stressed tonic and day cream in ‘normal/combination’. First of all I just want to say I LOVE this cute packaging and jars, you really feel like your using a quality product and they look great in the bathroom. 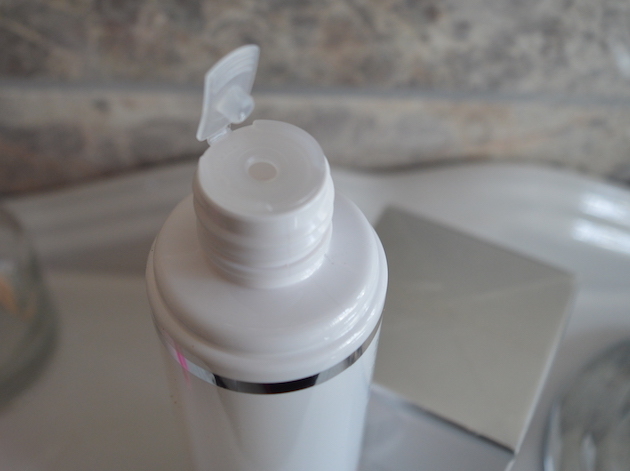 Little touches like the compass on the top of the cream, the twist the cream creates when you first unscrew it, the stopper that goes underneath the cap on the Tonic (which I’ve NEVER seen before – genius) and the easy to understand skin care benefits graphics on the back!….All little touches that make using these feel so nice. So beginning with the tonic, this is to hydrate, cool and sooth. It’s absolutey PACKED full of active ingredience with hyaluronic acid to hydrate and soften, Aloe vera to balance, Lipobelle Soyglycone (anti ageing), Syn® -Tacks (A peptide complex stimulating multiple skin cell proteins), Vitamin A to improve texture and Vitamin E to moisturise. Applying this tonic with cotton wool feels so refreshing and you really feel your putting some good on your skin! You feel like your treating it – not just like any old toner, this is a true tonic. Now the cream, using this De-Stressed cream is an absolute pleasure. Whilst moisturising, it never feels greasy or like ‘ you have to wait for it to sink in’ it just makes your skin feel comfortable, as soon as its applied. It gives you a velvet soft finish, rather than a dewey feel. The cream has Bioplasma FA which is a Anti-aging and detoxifying micro algae extract and also Shea Butter which regenerates the skin and is the best for moisturising!…. After the use of this for two weeks I’ve noticed that my skin feels soft and smooth and with a bit more calmness about it, which is what I wanted really after coming out in the dreaded ‘season change dry skin’. If you wanted to try this you can do for here , The day cream is £54, and the tonic is £28.00.